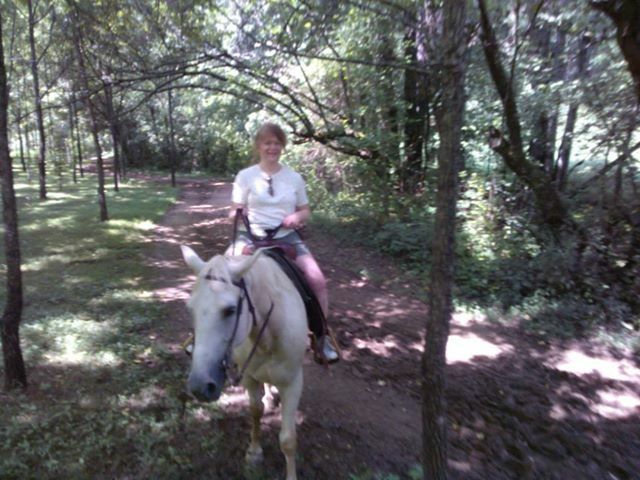 Last month I got to go on a trail ride in the Smokies. Tennessee is entrancing–the trail wound up and down steep paths, over a stream, past a waterfall. Beautiful. And I loved being back on a horse like my sisters and I used to do every vacation. I don’t think horses are unhappy being ridden. But I think there’s probably a huge difference between being ridden by someone they know and love, going on adventures together–a huge difference between that and toiling over the same ground over and over with a stranger (usually inexperienced) plunked upon them. I’d be interested to know what horse enthusiasts think about this. It did make me remember the research I undertook when I was writing the horse parts of my novel (working title–Three Prayers). One of my main characters was an animal lover/healer. I needed Daniel to be able to lead his horse without a halter, so I started looking on YouTube to see how it might be done. I ran across some videos that showed how to join-up with your horse. Fascinating. They showed how to get your horse to willingly follow you, as if they’re your walking companion. Here’s one: http://www.youtube.com/watch?v=rfaUPeYBfTY It gave me goosebumps the first time I saw it. They wouldn’t have had this method in 1850, at least not named, but I like to think Daniel would have this same sort of relationship with his horse, Babe. One of the fun parts of writing a novel is discovering what you don’t know about a subject and then learning some cool and interesting things you might never have looked into otherwise. Working on Three Prayers has taught me about goats, cheese-making, cuckoo clocks, the underground railroad in Indiana and Michigan, folk medicinal plants, pioneer life…I could go on and on. What a world!